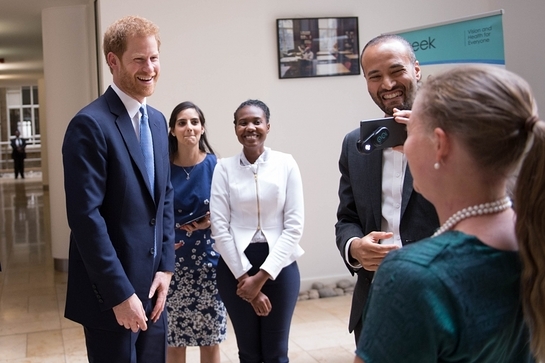 Prince Harry visited the London School of Hygiene and Tropical Medicine this week, where he learnt more about the school’s vital work combatting some of the world’s most pressing health issues and chaired a roundtable discussion about HIV. During his visit, Prince Harry met staff who worked on the response to the recent Ebola epidemic in West Africa, as well as some who are finding innovative ways to reach remote communities across the world and increase their access to treatment. The main focus of the visit was a roundtable discussion, led by the charity Sentebale, of which Prince Harry is Patron. At the roundtable, His Royal Highness and School Director Professor Peter Piot welcomed global leaders in HIV/AIDS and heard from Sentebale youth advocates from Lesotho and Botswana who described the challenges facing young people affected by HIV in southern Africa, and the reasons they believe youth across the region are failing to test for HIV and access relevant follow up care and treatment. One of the main aims of Prince Harry’s charity Sentebale is to support to children living with HIV in Lesotho and Botswana. Sentebale’s ‘Let Youth Lead’ programme was launched in April in Lesotho at the charity’s first youth summit, and aims to provide a platform for young people to advocate to their peers to test for HIV and safely manage their status.